1. Energy-saving furnace is used for the upcasting line, which is having a larger power for single inductor, better melting effect, and a longer life. 2. The gapless connecting expansion sleeve is used for the traction device, the PLC is used to control the servo motor correctly, and to assure that each order from the PLC is correct and accurate. 3. High accuracy and low backlash planetary reducer is used to make the freezing time more accurate, thus to increase the crystallzing quality. 7. The thickness of the furnace is increased, e.g., the furnace for 5000 type is 1.6 meters which is having a better heating preservation effect. 8. Quick lifting device is used for installing and changing the crystallizer, it can be finished within 10 seconds. When water or power supply stops, the crystallizer can be lifted quickly and leave the copper liquid. 9. 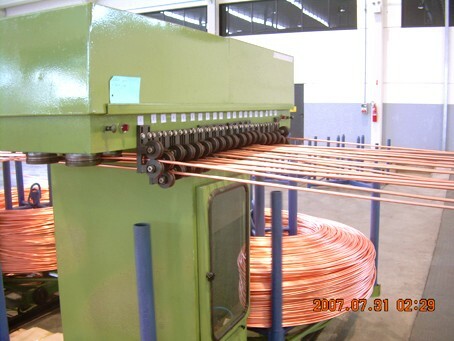 The copper rod upcasting machine includes line frequency induction furnace, continuous casting machine, rack of directive wheels, tension device, two-stroke coiler, cooling system, electric system,feeding system and measure temperature system and so on. Water jacket and coil all need to be cooled by water, the water can be recycling used, and is supplied by the cooling water system. 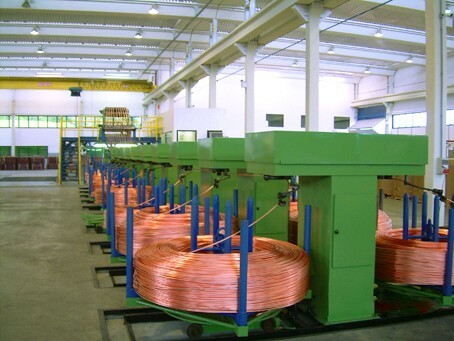 wheel, and drag copper rod separately .The automatic level track system could insure that the crystallizer is in the stable depth in the copper liquid, and to make sure the producing is continuously. The crystallizer could freeze the copper quick into solid-state by cooling it and realize the heat exchange, each crystallizer can be changed and be controlled separately without any influence of other cry stalkers' normal working. The line frequency induction furnace includes furnace body, furnace frame and inductor.The shell of the furnace is made of welded steel, inside part is made of casted refractory brick and quarts sand. Furnace frame is used for propping up the whole furnace, it is fastened on the foundation by ground bolt, inductor composed of coil, water jacket, iron core and copper channel.The high voltage side of the inductor(primary) includes coil with cooling water, the voltage could be adjusted form 90V-420V(holding furnace is 90V-380V), the low voltage side of the inductor(secondary)includes short circuited copper channel, after electrifying, it will produce big current in copper channel with the action of electromagnetism induction, and melt the copper channel and also melt the cathode at the same time . The main part to realize the continuous upcasting which includes the traction system, the level tracking system and the crystallizer, the structure is gantry four pillar.The output frame is set up on the upper part of the casting machine. It includes the platform, the support, the vertical guide wheel and roller. 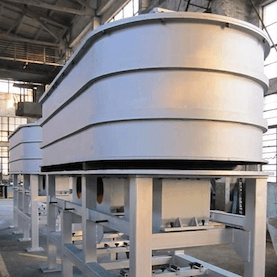 It separates and feed the casted rods into each double head take up machine without influencing each other.The water cooling system is an independent water recycling system which supplies the cooling water for the crystallizer, the water jacket and the induction coil. It includes one 200M2 water pool, water pump, pipelines and the cooling tower. It insures that the inlet water temperature is around 20-35℃, the flow rate is about 50m3. 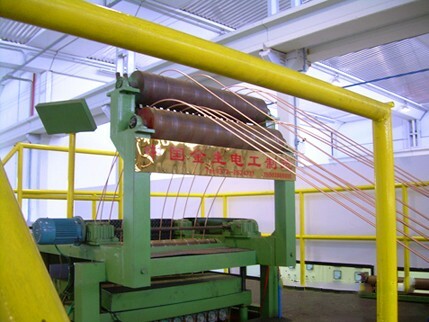 For a good heat exchanging effect, the user need to prepare the water soften device.The double head take up machine includes the traction roller, the coiling device and the coiling plate. Each unit of the take up machine includes four or three motors controlling the two sides of take up device for two rods, the max coiling weight is 3.5ton.